And I’m excited to have Trip Payne as our latest 5 Questions interviewee! A freelance puzzle constructor for over twenty years, Trip Payne is one of the most prolific and respected names in puzzles. 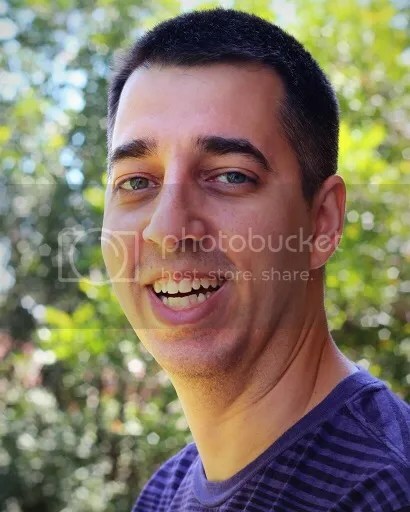 A multi-time champion at the American Crossword Puzzle Tournament, he’s been published in The New York Times, The Wall Street Journal, Uptown Crossword Club, GAMES Magazine, Will Shortz’s WordPlay, and numerous other outlets. On August 1, he’s launching his latest Puzzle Extravaganza, a collection of a dozen different puzzles (plus a special metapuzzle) for only $10! Previous extravaganzas have featured themes like the 2011-2012 television season and the Man of Steel himself, Superman, but this year’s theme is a closely guarded secret! Check out the details here, including an offer for three bonus crosswords! Trip was gracious enough to take some time out to talk to us, so without further ado, let’s get to the interview! 1.) How did you get started with puzzles? As a very young child, I was attracted to the black-and-white crossword patterns, and my parents noticed that interest and bought me children’s puzzle books. I was always into riddles, magic, games — everything sort of related to puzzles. Eventually I started coming up with puzzles for my elementary and junior high school newspapers, and when I was 15 I had my first puzzle published nationally in GAMES Magazine. 2.) What, in your estimation, makes for a great puzzle? What do you most enjoy — or try hardest to avoid — when constructing your own? In terms of crosswords, my #1 rule has always been: It’s All About The Fill. Of course you want a great theme and clever clues, but the second you resort to weak entries, you’ve lost my interest. A lot of people are willing to “justify” weak entries because they’re “necessary” to pull off a wide-open grid or an ambitious theme; I don’t agree with that. With enough work, and perhaps a willingness to pull back a little from the original concept, you can pretty much always avoid poor fill. Look at Patrick Berry: his themes are great, and you’d have to inspect his puzzles with a microscope to find a weak entry anywhere. That’s not magic — he just has high standards and a willingness to put in the work to make his puzzles as good as they can be. 3.) You’re a three-time American Crossword Puzzle Tournament champ and a perennial top 10 finisher. How does tournament solving differ from regular solving, and do you think your experiences with game show environments (like Who Wants to Be a Millionaire?, Million Dollar Password, and Scrabble Showdown ) helped you thrive in the ACPT? Well, not perennial, since I retired in 2011 (though I did compete one final time in Lollapuzzoola in 2013). My game show work all came after my ACPT championships, so there was no real connection there. 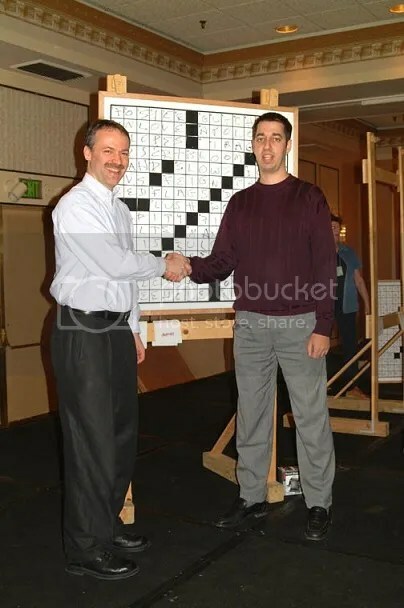 But I do think that the fact that I was a professional puzzlemaker before I started competing in puzzle tournaments helped me; for one thing, you get a sense of letter patterns and a feel for how a puzzle constructor might have filled a corner. 4.) What’s next for Trip Payne? I’m currently editing the Daily Celebrity Crossword for PuzzleSocial, and I have a few other regular assignments, such as the “wordoku” in TV Guide and my themeless crosswords for the Washington Post Puzzler. I plan to continue making my annual extravaganzas and hope to completely overhaul my website, tripleplaypuzzles.com, within the year. And I also hope to continue doing work writing and researching for TV game shows, and perhaps pitching my own game show ideas to producers. Enjoy the puzzles that you love, but experiment: there are all sorts of great innovative puzzles out there, and you might be surprised what you end up enjoying. Also, buy my puzzle extravaganza! Many thanks to Trip for his time. Check out his website for links to all his puzzly endeavors, and be sure to follow him on Twitter (@PuzzleTrip) for the latest updates on his many irons in the fire! Can’t wait to see what puzzle fun he conjures next. This entry was posted in PuzzleNation, Puzzles and tagged 5 Questions, ACPT, American Crossword Puzzle Tournament, Announcements, crosswords, GAMES Magazine, Geeking Out, New York Times, New York Times Crossword, Patrick Berry, Pop culture, puzzle extravaganza, PuzzleNation, Puzzlin' fool, Trip Payne, Triple Play Puzzles, wall street journal, Will Shortz, Will Shortz's WordPlay, Wordplay by gmdirect. Bookmark the permalink.